A pair of corporate mergers failed to boost the broader market Monday as investors await comments from Federal Reserve officials later in the week. 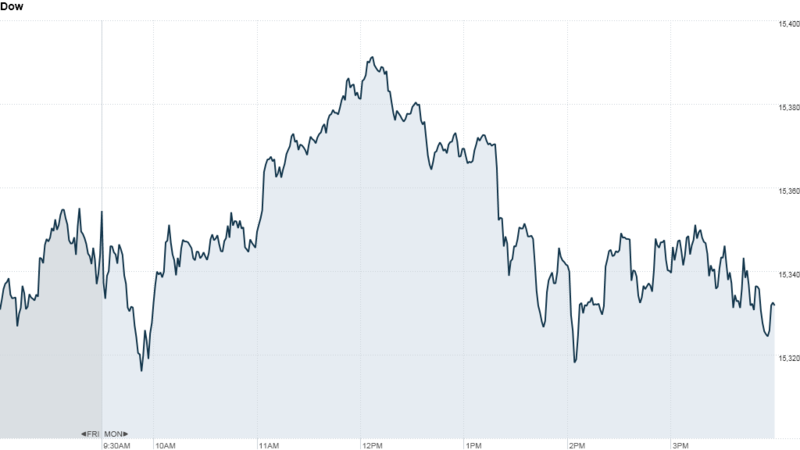 The Dow Jones industrial average, the S&P 500 and the Nasdaq all ended about 0.1% lower. Traders were wary of pushing stocks higher after the Dow and S&P 500 capped a four week winning streak Friday with new record highs. "It's a slow day," said Peter Tuz, portfolio manager at Chase Investment Counsel. "We've got some more important Fed news and economic statistics later in the week." Do you Tumblr? In an effort to lure younger users, Yahoo (YHOO) officially announced plans to buy blogging site Tumblr for $1.1 billion. The Internet pioneer promised not to "screw it up," but investors weren't so sure. Yahoo shares barely budged on the news. 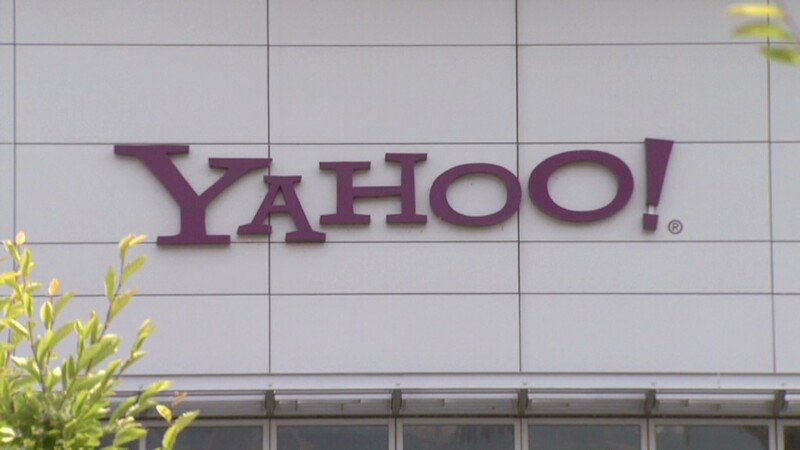 Will Tumblr make Yahoo cool again? Separately, Actavis (ACT) shares jumped after the drug company said it planned to buy Warner Chilcott (WCRX) in an $8.5 billion stock-for-stock transaction. Merger and acquisition activity has been picking up recently. So far this year, there have been 45 U.S. corporate transactions, worth a combined $297.6 billion, according to data from FactSet. The biggest deal has been Berkshire Hathaway (BRKA) and 3G Capital's $28 billion plan to buy ketchup giant H.J. Heinz Co (HNZ). Bernanke takes the stand: Investors will pay close attention to comments from Federal Reserve officials this week, including chairman Ben Bernanke, who will testify before Congress Wednesday. All three major U.S. indexes have gained around 16% so far this year on a combination of gradually improving economic data and continued support from the Fed. But investors have been rattled recently by comments from some Fed officials suggesting the central bank could begin to scale back its bond-buying program sooner than expected. "There's a tug-of-war within the Fed about an exit strategy," said Tuz. "We should hear more about that this week." The yen also rises: The yen edged up 0.7% versus the U.S. dollar Monday after Japan's economy minister suggested further weakness could be harmful to Japan's recovery efforts. The yen has plunged 15% against the dollar this year as Prime Minister Abe and the Bank of Japan launched an aggressive campaign to boost the nation's economy. Investors have been pouring money into Japanese stocks. Last week, the Nikkei rose above 15,000. It surpassed the Dow in absolute terms for the first time in three years, according to Bill Stone, chief investment officer at PNC Wealth Management. Earnings season winds down: Campbell Soup (CPB) reported quarterly earnings that beat expectations. Home Depot (HD), Best Buy (BBY), Target (TGT) and Hewlett-Packard (HPQ) are due later in the week. Chesapeake Energy (CHK) shares edged up after the natural gas and oil producer announced its new CEO would be Robert Douglas Lawler, an executive at Anadarko Petroleum (APC). Gold and silver prices recovered from earlier losses, but both have been under pressure recently. European markets ended higher, with the DAX leading the gains, although trading was light due to a national holiday in Germany. Meanwhile Asian markets ended with significant gains. Japan's Nikkei jumped 1.5%.